I'm so excited. OK, yes I'm excited for Black Friday....but I'm also excited because today is my first challenge with Paper Garden Projects. 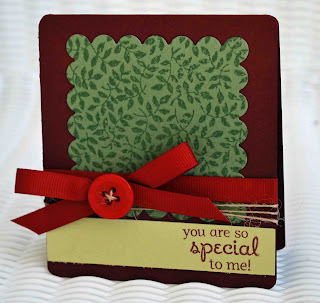 Our super challenge is to make a card, project, LO using a background stamp. Or use a stamp to make your own background. Be creative and have fun! I used my Impression Obsession stamp. 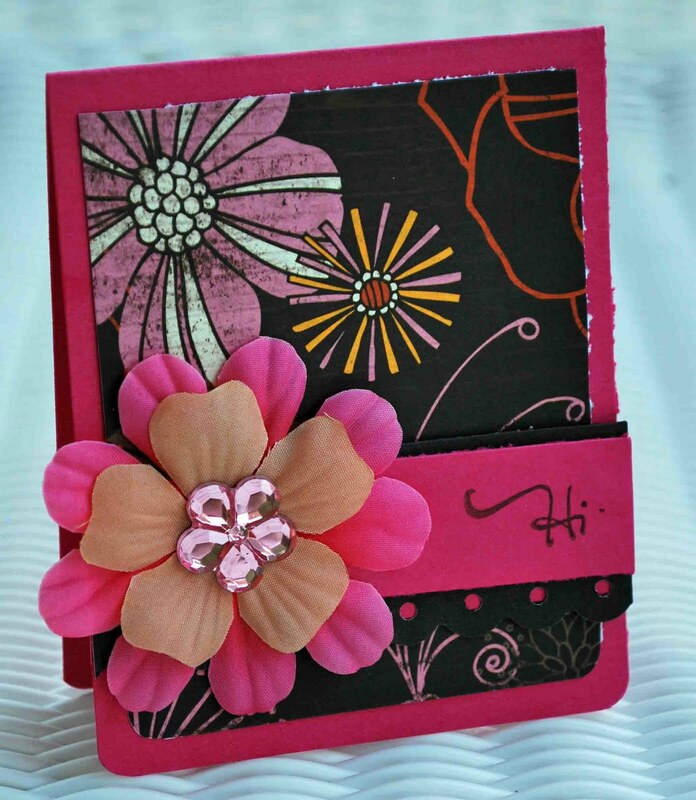 A Melissa Frances Rub-On and Prima Flower. I used my Spellbinder Nestabilities to cut small scalloped squares. I then took PTI cardstock and stamped it with a matching ink color. I stitched around each sqaure and then adhered them to my card. So easy and a different way to use a background stamp. Here's the link to the Paper Garden Projects Challenge. Up for grabs are two fabulous background stamps. And if you make a "black" card in honor of Black Friday, you can double your chance of winning! So be sure to play along! And a quick note. 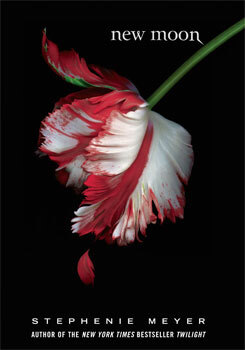 The winner of my Twilight Tuesday blog candy is Tamara Bennett!! Just e-mail me with your addy and I'll get your goodies in the mail! I have to work this Thanksgiving. But I am thankful God has given me the opportunity to help sick children thru the holidays. It really was a wake-up call my first year as a nurse when I had to work during the holidays. I never thought about who would take care of the sick during this time. It really made me realize just how blessed I was. It made me realize that the holidays are less about a "date" on the calendar and more about the love in your heart. We often get caught up in the activity of the holidays and forget about the sick, the troops, the less fortunate. Keep these people in your Prayers. Hope you have a very merry Turkey Day!!! I'm so excited to take part in my first challenge as a Design Team Member for A True Friend Challenge Blog! ATF is dedicated to scrapping your pets! 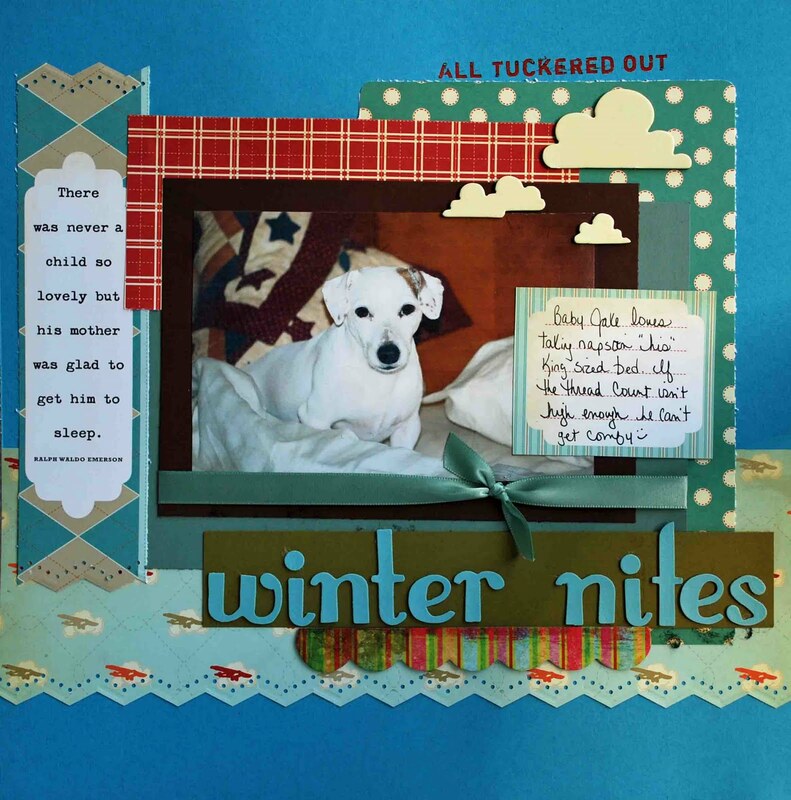 This week's challenge is to scrap WINTER NIGHTS with your pets. Does your little friend have certain traditions this time of year? Scrap it and share it with us! Leave a comment at A True Friends Blog so we can see your creation! Jake hates cold weather. So he is my little snuggle buddy this time of the year. He loves lying in bed and burrowing under the covers. And he doesn't like to be woke up early! For this LO I used Cosmo Cricket Lil Man paper, chipboard, and rub-ons. I also used Fancy Pants Chipboard and American Crafts Thickers. I used a Martha Stewart punch and Papertrey Ink ribbon. Visit A True Friend to see all of the Design Teams fabulous LO's! 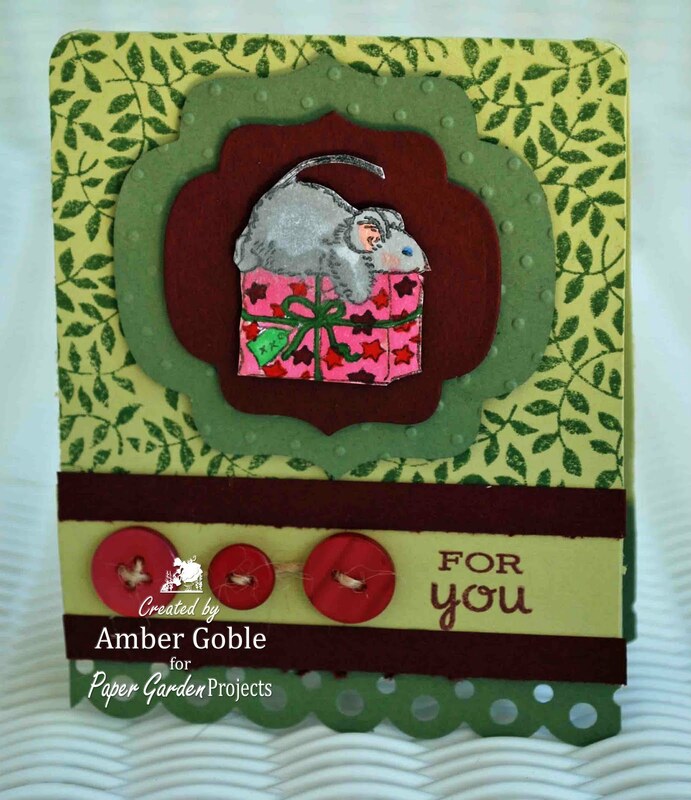 Paper Garden Projects Blog Hop!!! Welcome to the first ever Paper Garden Projects Garden Walk blog hop. Take a stroll through the blogs of all the Paper Gardeners and enjoy some wonderful Holiday inspiration. While you visit, subscribe to each Gardener's blog and take note of each designer's name and their special treat listed in their blog post. Once you finish your garden tour, send an E-mail to custserv@papergardenprojects.com with the list of designers and their special Holiday treat. 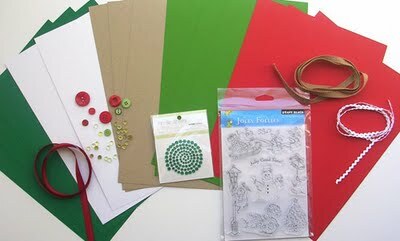 The first prize is a festive collection of Holiday paper crafting goodies. 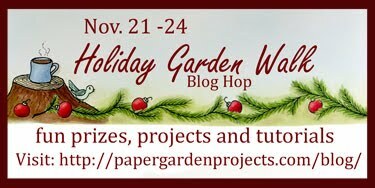 The second prize is a $7 gift certificate to the Paper Garden Projects store. 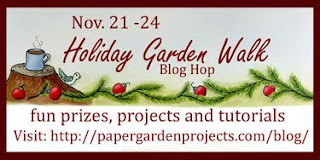 The third prize is a $5 gift certificate to the Paper Garden Projects store. Now for my Christmas treat....Twinkling Lights! For this project I knew the exact stamp to make the perfect card. 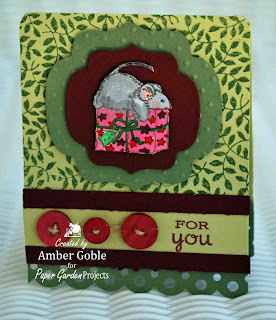 I used a Penny Black stamp from the set Christmas Critters, cardstock and ribbon available at Paper Garden Projects. The little mice are looking at the TWINKLING LIGHT of the lantern. I then took my Cover-a-card Greenery cling stamp available at Paper Garden Projects and stamped a strip of paper. I used a glass candle holder and wrapped my stamped paper around it and added ribbon and a bow. I added ornaments to my holder and for a perfect centerpiece. Just add a candle or TWINKLING LIGHTS! Hello everyone and welcome to the Twilight Tuesday NEW MOON blog hop! I am so happy to get to take part in the hop as a Guest Designer. 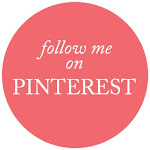 If you just happened upon my blog, visit Twilight Tuesday to get started. 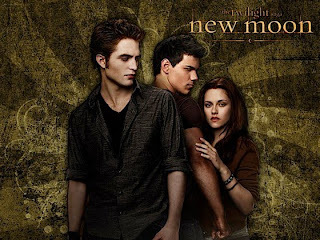 The blog hop is in honor of the release of the 2nd movie in the Twilight Saga, NEW MOON! Based on the bestselling book my Stephenie Meyer. You should have arrived here after visiting Juanita's Blog. Now for my New Moon creation. This has been one of my favorite projects ever! 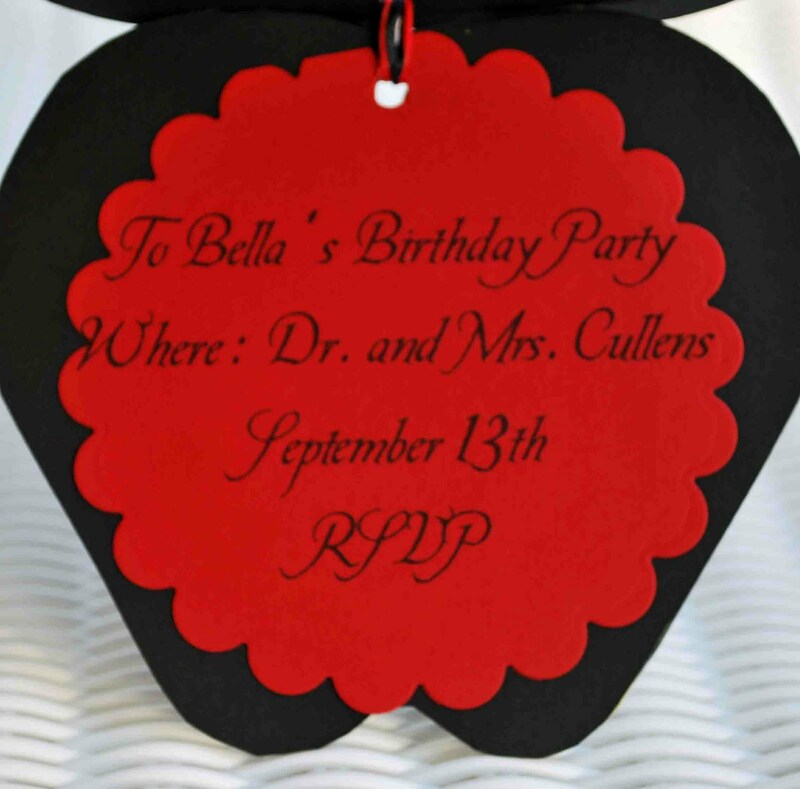 An invitation to Bella's Birthday Party. I felt like this was fitting because New Moon would have never taken place without the Birthday Party! For my invitation I used apple chipboard from Oriental Trading Company. Covered it in black PTI Cardstock. 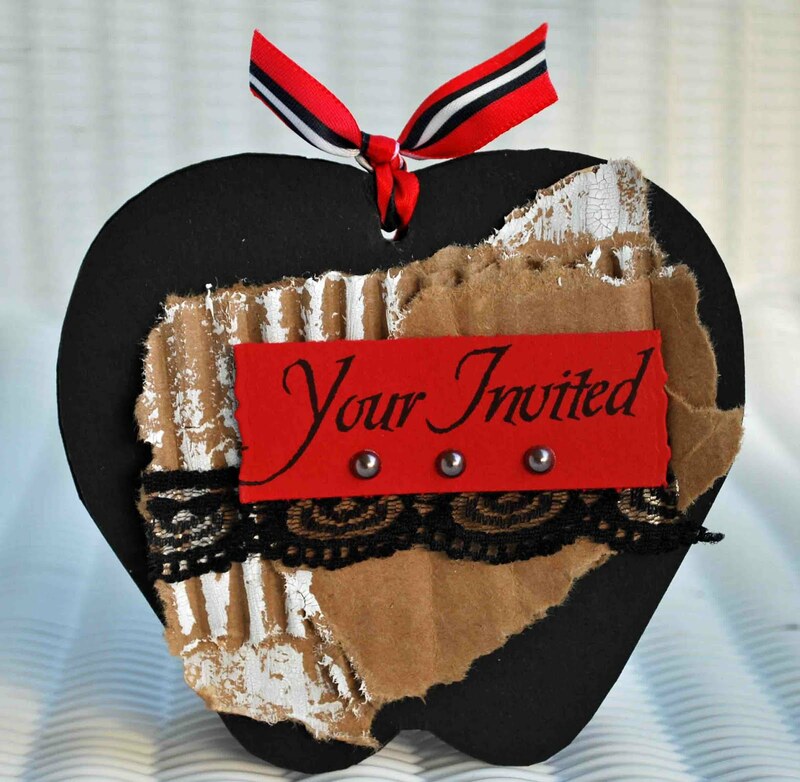 I then tore a cardboard box up and used a shredded piece to add to the front of my invitation. I then painted it with Tim Holtz Crackle paint. I used an Edward's handwriting font that I found for free, click here for the link. I also used my Spellbinder Nestabilities. And now for a little Twilight fun! Leave me a comment and let me know who your favorite character is from the book and why. I will pick a random winner for some New Moon goodies! 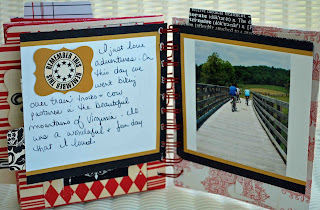 Your next stop along the path is Jen S. For the list of all Twilight Tuesday blog hop participants, visit their blog. I have my midnight tickets & my "Team Edward" T-shirt, so I'm ready to go! Don't forget tomorrow starts the Twilight Tuesday Blog Hop! I have a card to share tonight! 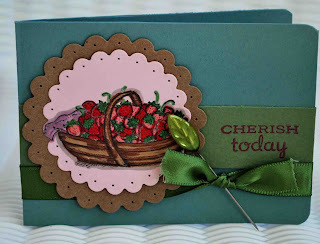 I made my card from stamps available at Paper Garden Projects Store. An early Christmas card to brighten your day! It's that time of the week! A new challenge from Die Cuts R Us! 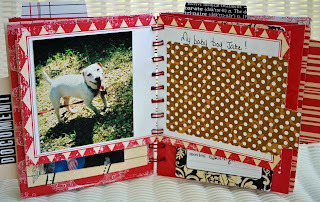 This weeks challenge is a fun one that I loved: Make a GIRLY project! The DT got to play with the Bo Bunny Delilah collection of papers, embellishments and bling that can be found at the Die Cuts R Us Store. 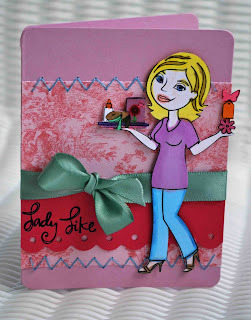 Please visit the DCRU DT Blog to see all the beautiful girly creations from the DT! And be sure to play along! I received an adorable award from my wonderful friend Melissa. 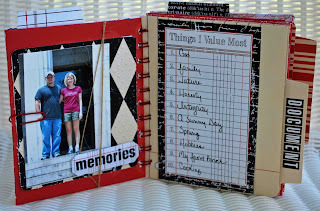 Check out her blog, you can find all kinds of crafty inspiration there! The rules are : I need to pass this award on to five people, post on their blog to let them know I left this award, and then I need to answer a list of questions in ONE word. OK, now to pick 5 people to play along! Every now and then something wonderful happens and you want to do a happy dance. Well I did a happy dance last nite, you wanna know why? 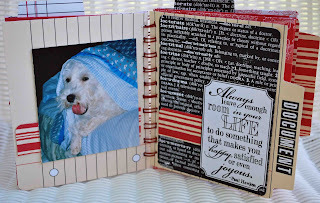 I'm being published in Scrapbook Trends in April 2010! Eek! That's been a dream of mine forever and it's finally going to happen! So cardmakers, be persistant and don't give up! You wouldn't believe how many cards I've sent them to finally get one chosen! In other news, I'm joining the A True Friend Design Team! This is a challenge site dedicated to your pets! 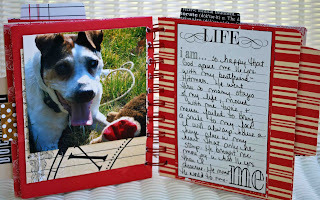 Yes, animal lovers there's a place to combine our love of scrapping and our love of pets! I'm sooooo excited to get to work on their challenges and hopefully this will help me keep up with all the LO's I NEED to do! 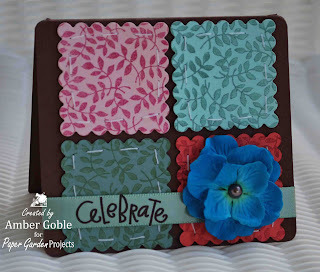 And Paper Garden Projects is also having a blog hop this month! It's going to be great and the DT is sooooo talented, can't wait to see what everyone makes for the hop! Details are in my sidebar! And with all these new ventures I had to give up something! So I stepped down from my DT position at Cuttlebug Challenge. I felt like it was time to let someone else have the wonderful opportunity Maggie gave me. Without Cuttlebug Challenge I would be clueless about DT's, tutorials, card techniques, the list goes on and on! OK, so I've had a good week! Just had to share my news. Now I have a card for you. In honor of a fabulous week I made a fabulous card, hehe! It's time for a new Cuttlebug Challenge! This week is a sketch challenge. 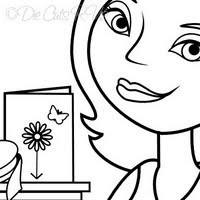 Visit the Cuttlebug Challenge Blog to take a look at the fantastic sketch. This week's challenge is extra special because we are teaming with Operation Write Home. This site helps send cards to deployed men and women fighting for our freedom. This is such a great cause for wonderful people! I used paper from PTI and Melissa Frances, Cuttlebug & Diamond Plate, Spellbinder Nestabilities, and Ribbon. Plus a Jenni Bowlin Bingo Card. Visit Cuttlebug Challenge to see the inspiring creations from the DT! 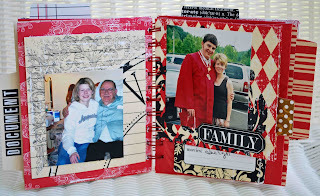 I used Core'dinations Paper, Papertrey Ink Stamps and Ribbon, Fiskars Punch, Stickles, and Spellbinder Nestabilities. This card is simple!!! I think that's my favorite style! 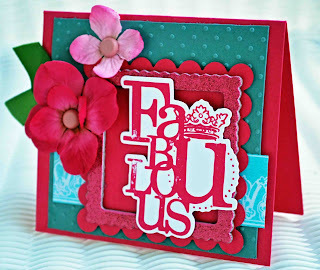 Visit the DCRU Store to see all the QuicKutz embossing folders and visit the DCRU DT Blog to check out the DT's amazing creations! I used random.org to pick the winner of the DCRU digi contest. And my winner is Yvette of Handmade Etc. Please e-mail me with your address and I'll get your package in the mail! 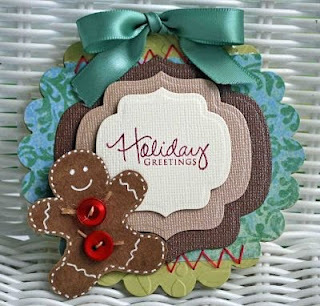 To see the list of winners visit Die Cuts R Us DT Blog. 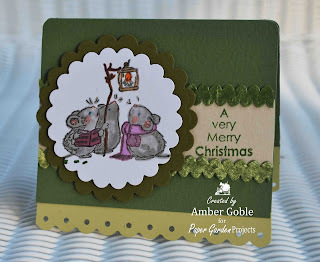 Now I have a couple of cards to share with you using stamps from Paper Garden Projects! 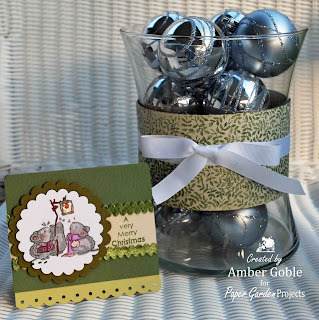 Visit Paper Garden Projects Store & Blog for even more inspiration! Happy Wednesday! 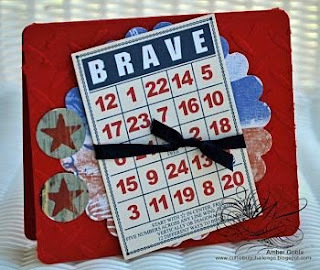 You know what Wednesday's mean at my blog, a new challenge from Cuttlebug Challenge. This week's challenge is to make a gratitude or Thanksgiving project and use your Cuttlebug! The DT got to play with a Teresa Collins Journal Kit - and the winner of this week's challenge will get a Teresa Collins kit of their own! And this week we are having 2 Guest Designers! Teresa Collins and Jamie Harper! So be sure to tune in! I just loved all the little elements of the kit. 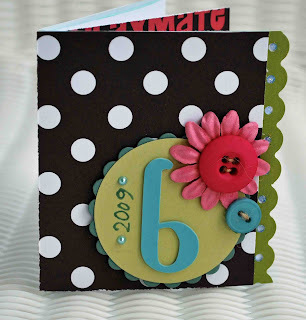 I used all Teresa Collins products plus my Cuttlebug and Swiss Dots, Victoria, and Diamond Plate embossing folders. I also used Twine from Papertrey Ink. I based my journal on people and things that I am blessed to have in my life. Hope you enjoyed a glimpse into what I'm grateful for. Visit Cuttlebug Challenge to see the DT's amazing creations for the week! And don't forget this week kicks off the start of Cuttlebug Challenge University! This week's lesson is Copics! Be sure to check out the awesome hints and techniques! Hi everyone, time for a new challenge at the Die Cuts R Us DT blog. This week's challenge is to "nest something". The DT got to play with Spellbinder Nestabilities Labels die cuts. Participants interpret this challenge to be whatever you creative mind thinks of and post a link to your creations at the DCRU DT Blog! I started out by using my large Spellbinder Nestabilities and cutting out 2 scalloped circles for the back and front of my card. 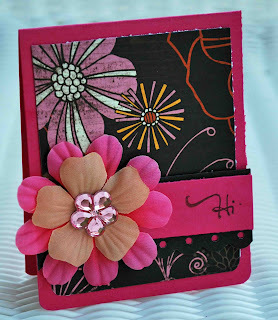 I embossed the front of my card using the Cuttlebug and Victoria folder. I then cut a strip of Melissa Frances patterned paper with a nestie and stitched it to the front of my card. 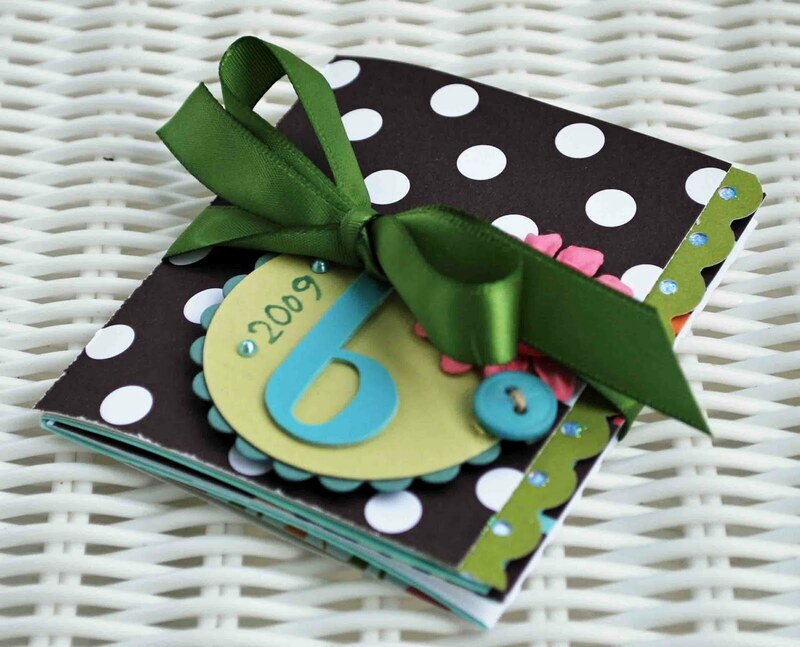 I then used the label nesties and stamped the top one and layered them using pop-up dots. I added a Papertrey Ink stamp and ribbon. I made 2 small holes at the top of my card using my Crop-a-dile to run my ribbon thru for my bow. Visit the DCRU DT Blog to see the DT's amazing creations. And don't forget DCRU is having giveaways, visit Claudia's blog to get started! The digital stamp release is today at the DCRU Store! And her name will be revealed! Please check out Claudia's (owner of DCRU) blog to see all details of the release. I used the new DCRU digital stamp, patterned paper by EK Success (available at DCRU), cardstock and ribbon from Papertrey Ink. Copics from DCRU. Now for the giveaway. Leave me a comment here, letting me know how you like digi stamps and I'll randomly pick a winner. 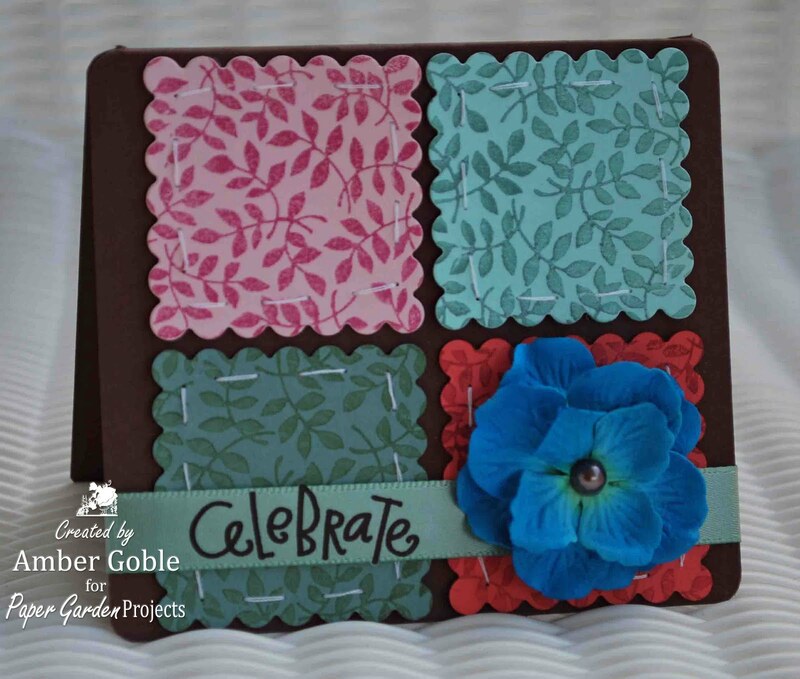 The winner will receive my card plus a card kit with paper, ribbon, buttons, and goodies in it. Everyone, no matter where you live, is welcome to play along! Visit the links to the right that takes you to the DCRU DT's blogs for more fun. And visit Claudia's blog for the DT's digi projects and MORE giveaways for you to enter! Winners will be announced on November 8th!